Benchmarking for Best Practice uses up-to-the-minute case-studies of individual companies and industry-wide quality schemes to show how and why implementation has succeeded. For any practitioner wanting to establish best practice in a wide variety of business areas, this book makes essential reading. It is also an ideal textbook on the applications of TQM since it describes concepts, covers definitions and illustrates the applications with first-hand examples. Professor Mohamed Zairi is an international expert and leading figure in the field of benchmarking. His pioneering work in this area led to the implementation of sixty comprehensive benchmarking projects in companies worldwide. He has written several books on this subject including 'Practical Benchmarking' in 1992. 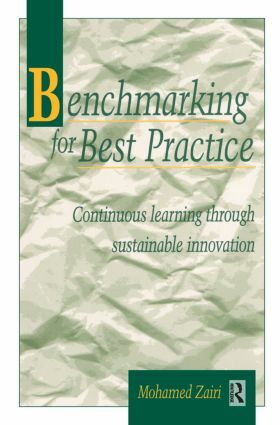 'Benchmarking for Best Practice is a valuable reference tool ..
…a treasure trove of best practice exemplars. Driving businesses with quality in the 1990s; Achieving a competitive advantage through TQM; Critical factors for effective TQM implementation: a benchmarking approach; Benchmarking quality systems: the role of auditing; Benchmarking innovation management for best practice; Benchmarking customer satisfaction for best practice; Benchmarking supplier partnerships for best practice; Benchmarking TQM in health care for best practice; Benchmarking quality in financial services through the EQA self-assessment model; Benchmarking performance measurement for best practice; Benchmarking processes for best practice; Benchmarking external corporate quality reporting for best practice; Index.